Add to Your Calendar: 04/18/2019 14:00 04/18/2019 15:00 America/Chicago CHESS CLUB! Come every time or whenever it fits with your schedule. 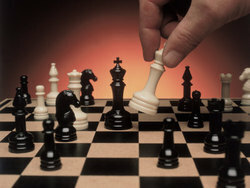 This is a great opportunity for chess enthusiasts to gather and enjoy the game of chess. We begin with a short lesson and then fit in as many games as time allows. Price is FREE! If you have questions, contact Judy Maichel at 314-352-1319 or mjmaichel@juno.com. WHY IS CHESS IMPORTANT? Chess is a game for all people , the game helps to develop memory , improves concentration , develops concentration , imagination and creativity , chess teaches independence , chess develops the capability to predict and foresee consequences of actions , chess inspires self-motivation , chess shows that success rewards hard work , chess helps to facilitate critical thinking skills , chess improves school work and grades , you get to meet like-minded people , chess is an inexpensive game to play , and chess is entertaining .